If you're worried about your circulatory health, there's little you can do that will help more than keeping your cholesterol levels within a healthy range. The single best thing you can do to make this happen is to understand and act on the ways different foods, like potatoes, interact with your blood serum cholesterol. The cholesterol content of food -- dietary cholesterol -- isn't the important factor in keeping your cholesterol levels healthy. Instead, it's the fat content of the foods. Your body makes LDL cholesterol -- the bad cholesterol that hurts your circulatory health -- when you eat foods containing saturated fats. HDL cholesterol, the healthy cholesterol that helps your heart by cleaning out LDL, is produced when you eat foods rich in unsaturated fats. Although classified as a vegetable, potatoes are closer to grain foods like bread and pasta. They are high in carbohydrates, low in fat and very high in starch. 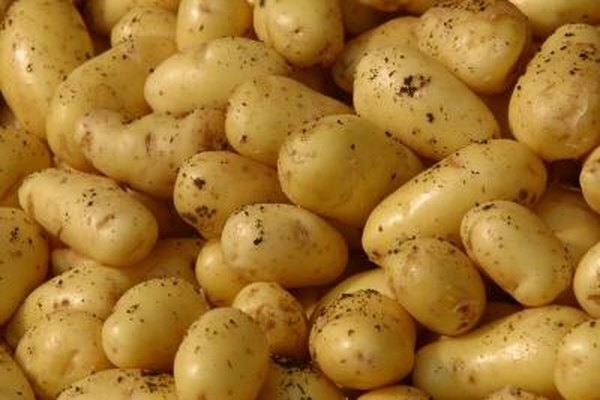 Some potatoes common in the American diet include white potatoes, red potatoes and sweet potatoes. According to the U.S. Department of Agriculture, potatoes are low in fat. White potatoes contain less than 0.1 g of total saturated and unsaturated fats per medium potato. Red and sweet potatoes contain less than half a gram. This means that potatoes will have little effect on your body's production of either harmful LDL or helpful HDL cholesterol. Triglycerides are not technically a cholesterol, but they affect circulatory health like LDL and are measured in your total cholesterol readings. Your body makes triglycerides in response to spikes in your blood glucose levels. The high content of starch, sugars and other simple carbohydrates in potatoes means that they can stimulate your body to produce triglycerides -- which in turn can negatively affect your total cholesterol levels and your circulatory health.